September ended with the S&P 500 index increasing 2.1%, continuing a pattern like the previous eight months of 2017 by calmly grinding higher. Despite a weather-ridden jobs report today, solid economic numbers and consistent U.S. corporate earnings supported the market in the face of ongoing tensions over North Korea. The U.S.-based S&P 500 gained 4.5% in Q3 and now registers a total return of 14.2% for the year including dividends. 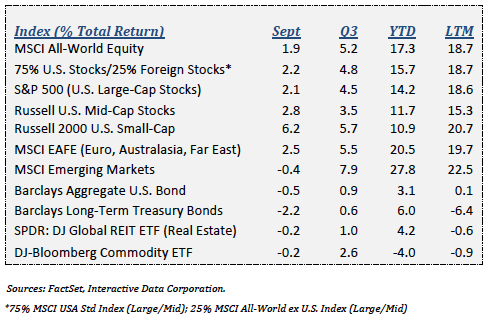 Large-cap foreign shares were up 5.5% for the quarter and continue to lead U.S. shares with 20.5% YTD gains. The U.S. dollar fell 2.7%, boosting returns on foreign assets. Nine of the eleven broad S&P 500 sectors show positive returns through Q3, with technology stocks continuing to lead the market with 26.6% gains. Healthcare firms are up 19.1%, while telecom and energy stocks are the worst performers with losses of 7.9% and 15.1% YTD, respectively. The bond market pulled back as the Fed and global central banks continue to prepare for more rate hikes. A tightening oil market also lifted inflation expectations, further weighing on bonds. The U.S. bond market lost 0.5% for the quarter but has posted total returns of 3.1% for the year. Clients, friends in the neighborhood, and strangers at the grocery store all want to know when the stock market will decline. Certainly, there is a lot to worry about, but much less so if one is prepared for the pullback. We note that this particular economic expansion is approaching 100 months, the third longest since the late 1800’s. Though not as high as during the internet boom of the 90s, valuations on stocks are in the upper ends of historical ranges. There is also the concern that the economy and the stock market are too reliant on Federal Reserve monetary support, and could react badly when that support is withdrawn. Markets rise and fall in unexpected ways. As professional advisors, our job is to be in a perpetual state of worry. This ensures that we approach investments with an appropriate amount of caution and skepticism. After 30 plus years in the business, one thing we are sure of is that no one can predict the next rally or downturn. One observation from our experience: when everyone is confident that nothing can go wrong, watch out below (think “new paradigm” during the internet boom). When everyone is worrying about a correction, then it’s likely not at hand. There is nothing scientific about this observation, and we are certainly not sending the “all is clear” signal. The next downturn will not happen just because it is overdue. However, the fact that so many investors are looking for a correction gives us some comfort. We continue to focus on our investment discipline. Our investment staff monitors global markets daily. As stock prices and valuation metrics reach thresholds, we sell or rebalance expensive positions. Within the stock portfolio, our focus is on quality companies that can survive the next downturn and carry on. On the bond side, we continue to move from credit backed bonds to government issues that hold up best during recessions. Broad and well-structured diversification is a critical component of our risk management strategy. Following the discussion of investment philosophy and asset allocation in previous letters, we delve more deeply into how we build our models for diversification below. We have discussed the factors that determine the right mix of stocks, bonds and other assets and why a low cost indexed approach makes sense as a base for your portfolio. But that leaves a lot unanswered. Which stock funds are appropriate and what area of the bond market should I seek secular exposure? The goal is to find the right assets that provide adequate exposure to the broad market and avoid redundancy in your portfolio. Finance theory from the 60s, namely the efficient market hypotheses and the capital asset pricing model, concluded that each investor should invest in exactly the same portfolio of assets. This portfolio is approximately split 50/50 between stocks and bonds, with nearly half of the equity and a considerable amount of the bonds denominated in foreign currency. * These old theories are often justification for a passively indexed global portfolio. While this may be a starting point, it is rarely the right fit for anyone. US Large Stocks. Large multinational stocks are typically measured by the S&P 500. These are the largest stocks in the US market. Some stock investors use the S&P 500 as their sole exposure, but a better answer includes owning a mix of other equity asset classes. US Small and Mid-Size Stocks. These stocks are smaller in nature and tend to be more US focused. Since these companies operate on a slightly smaller scale, they tend to be more volatile. Because of this higher risk, they typically add return over a large-cap portfolio. International Developed. We don’t believe half your stocks should be internationally invested. However, the largest companies in Japan, U.K., Canada, and Europe are important players in the global economy and belong in your portfolio to some degree. In any given period, large international stocks may under or out perform their US counterparts. These stocks are denominated in foreign currencies, which also provides diversification away from the US dollar. Emerging Market Equities: These stocks are the most highly leveraged to global economic growth. Many emerging companies are tied to the production of raw materials, and serve economies with high consumption growth. With this potential upside comes greater risk, particularly during economic recessions. They also naturally contain foreign exchange risk. Government Securities: Despite the recent gridlock in Congress, US Treasuries are still the safest securities for your money because the federal government ultimately controls the printing press for the world’s reserve currency. During times of stress, investors flock to Treasuries for this quality and over the long-run, their returns tend to be lower. The primary risk to Treasuries is higher-than-expected inflation. TIPS: TIPS are bonds indexed to inflation. When inflation is higher than expected, TIPS usually perform better than other bonds paying a fixed amount. International Bonds: International bonds add diversification to other fixed income assets as global interest rate cycles are rarely in sync. Since these bonds are denominated in foreign currencies, they help protect against inflation as the US dollar typically falls when inflation increases. Credit: This includes corporate, municipal, agency, sovereign debt, and mortgages. This market makes up nearly two-thirds of the domestic bond market. Lending to corporations, state, and local governments should over time generate a return higher than Treasuries. Cash: Although not immune to risk, cash is the ultimate safe asset providing stable returns relative to other stocks and bonds. Inflation slowly erodes the purchasing power of cash. We believe owning these core assets can balance your portfolio in a way that is an efficient use of your wealth. Using low-cost index funds avoids overpaying for active management and improves risk control since we have a better understanding of what is underneath the hood. For many investors, a low-cost core approach is all that is needed. For others, combining low-cost index funds with active stock and bond picks better addresses their needs. In a future letter, we will discuss our core-satellite approach to portfolio construction, a method that joins a relatively stable core portfolio with a more actively managed satellite component. The appeal of core-satellite investing is that it combines the benefits of indexing – broad diversification, lower cost, tax-efficiency – with active management and the potential for outperformance and improved risk control. The global asset markets are made up of many diverse investors – sovereign wealth funds, insurance companies, central banks, and you. Each has its own objectives for putting its money to work. Just like them, it’s important to make the financial markets work for you, tailoring your strategy to fit your needs, wants, and risks. We continue to work with our clients, based on their individual circumstances, to ensure they are well-positioned for the inevitable ups and downs. If your situation has materially changed as of late, let us know so we can re-evaluate and continue our holistic approach to investing your money. * Doeswijk, Land and Swinkels. The Global Multi-Asset Market Portfolio, 1950-2012. Financial Analyst Journal. March/April 2014. Vol 70. No. 2. 21-41. Updated by ProffittGoodson.